Honda confirmed in their Geneva press conference that the order books for their production version of the Urban EV Concept will open in early 2019. The Urban EV Concept is an insight into the first-mass produced 100% electric powered vehicle sold in Europe by Honda. The exterior is a simple and sophisticated design with slim A-pillars and a wide windscreen that sweeps across the front of the passenger cabin. Inside, an ambience of a lounge has been created from two bench seats which can accommodate four occupants comfortably. The rows are upholstered with natural grey fabric and embellished with contemporary wood finish accents. A wrap-around screen takes centre stage in the vehicle and spans across the entire dashboard and into the doors. The extended door screen also function as the car’s side mirrors through digital camera displays. Honda at Geneva 2018 revealed their last generation of the wold’s best-selling SUV – Honda CR-V. Improvements include interior quality, refinement and spaciousness – with the option of having seven seats for the first time. The all-new CR-V has a fresh and sophisticated exterior design with muscular wheel arches, sharper contours and the new Honda family ‘face’ signature headlight graphic. The design has been refined to create one of the most aerodynamically efficient vehicles in its class, from thin A-pillars to sculpted bumpers and under-floor covers. Honda’s Active Shutter Grille system also further improves fuel efficiency. The new interior design highlights a more spacious cabin by the feeling of width and conveying a sense of strength. The dashboard includes two 7-inch displays and the layout of controls has been simplified and located under the central screen. The all-new CR-V has slightly larger proportions from its predecessor with a longer wheelbase and wider stance providing a roomier interior. The new CR-V’s best-in-class space provides all occupants with superior space and comfort. The new boot is wider and deeper with a longer load bay and includes a new two-positioned boot floor. For the first time ever all petrol models will be available with the option of seven seats. The third row of seats offer exceptional leg room and a 101-degree seat angle to ensure comfort in long-distance journeys. Access to the third-row of seats is also class-leading, due to a wide and low step-in aperture. For the first time ever, Honda hybrid technology will be available in an SUV sold in Europe. The all-new CR-V will be offered with Honda Intelligent Multi Mode Drive (i-MMD) hybrid system, which compromises of a 2.0 litre i-VTEC Atkinson cycle petrol engine and two electric motors. The new system delivers real-world efficiency and effortless driveability from the new transmissions system offering a smooth transfer of torque. The petrol option consists of a 1.5 lire VTEC Turbo Engine, providing strong performance and class-leading fuel economy. Power is delivered via a six-speed manual gearbox, or an optional CVT automatic transmission. Both powertrains are available with front-wheel drive as standard, but both can be specified with Honda’s latest all-wheel drive technology – ‘Real Time AWD with Intelligent Control System’ – giving all-terrain capability. First deliveries of the Honda CR-V are expected in Autumn 2018 for the petrol modes and hybrid variants following in early 2019. 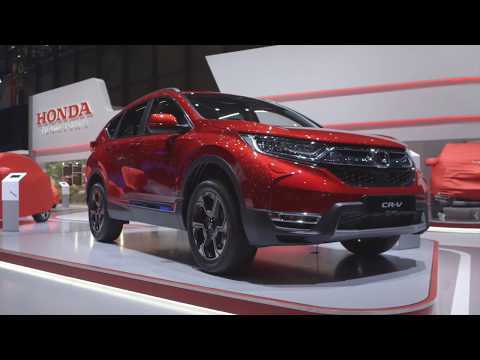 Catch up on the latest news from the Geneva 2018 Motorshow by watching this video by Honda UK.